In 1972 I worked in the estuary of Pechora river and visited river Izhma, where this old legend arose. So it happened that it had taken my attention for a long time. The hero of it — Yag-mort, who is opposite to Versa — a fantastic inhabitant of woods Leshy, acts as a real living creature. Its name in translation from native is “the man of woods”. I started to record the stories and legends about Yag-mort. I was impressed strongly by their freshness and how very realistic they describe appearance and behavior of Yag-mort. “In twenties of the century, when I was 15, we were mowing grass on the Tsilma river bank at 10 kilometers from the village. Six boys, two adults and me worked about three hundred meters from the river storing the hay. Nearby there was a small wooden house (izba), where we lived then. Suddenly two unknown figures have appeared on an opposite bank of the river. The small one was black, the other of huge growth (more than two meters) was gray and white. They were similar to the human but we had felt at once that they were not the people and looked at them motionless. They began to run around a large willow tree. The gray ran ahead and the small black one quickened after him. They played and ran very quickly. No clothes were noticed on them. The play was several minutes, then they ran to the river and had disappeared from view. We hid ourselves in the house and for an hour were not brave to leave it. Then, with a rifle and other arms, we have crossed the river by a boat to the place, where they ran. There we had found footprints of the both strangers — large and small. Many of them were around the willow. I do not remember fingers on the small prints, but I have observed quite well the large ones. They were as large, as valenki. The fingers were represented sharply. There were six of them and they had approximately identical length. The footprint were very similar to that of a human, but flat as bear's. The fingers were not held together, as man's, and slightly pointed in the different directions”. Efim told it in low voice, as if he was afraid that I do not believe. His wife Maria remembered this history too. Efim remembered and had drawn strange traces, being sure in all details of the figures. The similar stories I had heard from Maria Vokueva from Trusovo village, from Ivan Toropov and his wife Ulyana from village Medvezhka and many others. Husband and wife Kharlamov's who were on recreative travel by kayak on a small forest river met mysterious inhabitants of woods. In 1956 on Aiuva river they saw unusual creatures that were similar to those seen by Bulugin. They described that the strange wood inhabitants had a magnificent constitution and were high. The creatures had no clothes but were covered by long black hair. They laugh loudly in inhuman way. They have appeared suddenly and have disappeared in a moment having crossed the river under water. Then they made noise on the opposite side of the river. “In 1960 or 61 I went in the evening from Yaraskogort village to Vasyakovo by bank of Mountain Ob river. There were two dogs with me. Suddenly they grinned, barked, and had rushed forward. Then have returned and again have escaped forward. When they have returned again, they fearfully came to me and kept silence. Victoria Pupko (docent of the Moscow institute for building technology) and me listened to him with a view that we are not surprised at all. — And what is this Kul on your opinion? — we asked him at the end of the story. — I do not know, — shrugged the ranger by shoulders. — Sten-ekhti-agen — "who is wandering the woods". I saw it four times. Two times just after the War and twice 15 years ago. At Lower Ob, on the rivers Synya and Voikar everybody knows the like stories, but not everyone will tell them to any passerby. Khants are simple and unsuspicious people, but very sensitive to any sorts of sneering and direct inquiries. It is interesting that common people — the fishermen and reindeer herders, mainly tell about the man of woods. In city Salekhard we had got acquainted with the remarkable Russian woman Marfa Senkina, the widow of the legendary revolutionary. She was a former school teacher and it was important for us to hear the story that lightened the secret attracting us. "Before the Revolution I with my father often traveled to hunters all over Lower Ob and peninsula Yamal. I was then 20, and we lived in Salekhard. We often stayed at an old Khant home near Puiko village. As I remember, it was at beginning of September, the night were already dark, and our dogs frequently barked at nights. Once their barking became especially fierce. For the second night such ferocious barking of dogs had repeated. I have asked ours Khant host what they so barking at. And he answered by whisper that Zemlemer is coming here. — What Zemlemer? — I have not understood, zemlemer in Russian means a person who measures the borders for land owners. — This night I shall show you, — he had promised. — But only look at it cautiously — through fingers. In midnight we went out from a choom (a native dwelling covered by skins of deer). The moon was large and red. We waited, probably, about an hour. And suddenly the dogs started barking again. I had seen the extraordinary high man at several dozen meters. Our chooms were surrounded by two-meter fence. The head and the shoulders of the man towered above it. It walked very fast right through the thick bushes. The eyes glowed as two lanterns. I never met such terrible and high man. The dogs with barking have rushed to him. One of them, obviously having courage by our presence, had run to him very close. The man had bent over, seized it and had thrown it far in the bush. We had heard only short yelp when its body , which has flight in the air. The man quickly has left, never having turned back. — What is it, Leshy? — I have asked the old man. — Don't speak this word, — he was frightened, — you will invite him by this to the chooms. Call simply Zemlemer. He comes here every year at this time. At the morning we had missed one of the dogs”. Zemlemer in the story by M.Senkina, an approximate look. We have got acquainted with dozens of peoples that in different times personally saw mysterious wood creatures, similar to the human and at the same time conducting the wild way of life. "At the Autumn of 1845 professional native hunters Ostjak, name Falaley Lykysov, and Nenets, name Obyl, had killed in thick taiga an unusual monster: with human figure, 3 arshin (about 210 cm) high, with one eye on the forehead and the other on the cheek, skin covered by rather thick hair, cheekbones were clean, on hands there were claws instead of fingers, on legs there were no fingers at all, male. 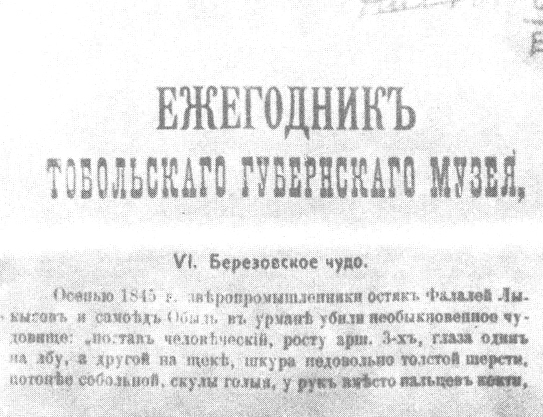 Retired uradnik Andrey Shakhov has sent at 16 December 1845 a report about this to Berezovo local court". Snapshot of a year-book page with article about “A prodigy near Berezovo”. An year-book of Tobolsk museum, 1907. These words started one of the strangest unsolved investigations which ever were conducted in criminal court of Russian Empire. The documents are kept now in archive of regional museum in Salekhard. The case was reported to the Tobolsk governor and to administration of the district. The following explanations of the participants of incident were received. Obyl had explained that he together with Falaley had found a monster in taiga. It was shown by barking dogs and the creature defended itself from the dogs by the hands. Falaley approached at 15 sazhen (about 32 meters) to the monster and shot it from the gun. It fell on the ground. They had examined it in every way. It had had no anything with it. It was 3 arshins (213 cm) high and covered with hair. Hair was absent on the nose and on cheeks only. The hair was thick and about 2 cm long of blackish color. There were no fingers on feet, the heels were pointed, fingers on the hands were with claws. They cut the body for examination and had found it blackish inside and the blood was blackish too. The body of the monster was left without protection on that place. The local police officer was ordered to find a body of the monster, but the residents for a long time refused to show the place, where it was killed. At the end they came to a glade, on which there were no traces. So a case names as "Berezovo prodigy" was left unclean. There are three special average educational schoolls in Salekhard. They are attended by girls and boys of reindeer breeders families from entire Yamalo-Nenets national district. Every summer they travel with their parents on infinite spaces of tundra. I prepared a questionnaire for future teachers, medical assistants, and veterinarians. The first question in the quiz was: "Did anybody meet a wild man in the tundra?" 48 of 60 pupils replied affirmatively. Twelve answered "I don't know." The second question was: "How do the Nenets call the wild man?" The third question was: "Who had recently seen it by himself or close relatives did?" (here the sixties and seventies were meant). Four had seen the Tungu with their own eyes, but at a significant distance in twilight. They could not give detailed description of it. Ten pupils said that their fathers, grandfathers or brothers had seen it. The fourth question - "How did those who saw the Tungu describe it?" "It is very tall and thin. Shaggy, it was probably wearing a skin. It makes shrill whistle and runs very fast. It is met on all North from Ob to Yenisei, in tundra of Gyda peninsula, and much to the south in woods along Nadym and Taz rivers." In Nida settlement at Nadym destrict where I had continued inquiry among skilled reindeer breeders and fishermen I did not meet anyone, who would deny its existence. All of them told the same — Tungu were frequently met 15 — 20 years ago and for the last ten years nobody met them at all. “They had left somewhere, probably, to woods in the South”, — spoke the old men. "Tungu is a wild man, they were often met in the autumn when days in tundra become dark. It is very high — two meters, probably. They live in woods under trunks of trees. They can't to speak, but capable to whistle and shout like "Roo-Roo-Roo". It sometimes approaches the chooms to steal a girl. In 1962 it had thrown sand in my choom and whistled. But nobody had left out to it as all were afraid of it. Earlier, in 1929 I saw foot traces in August. They were long and narrow. Tungu can run faster then reindeer". It is interesting that Nenets clearly differ Tungus people (Evenks) and wild Tungu so the names sound similar. If the stories about Tungu are trustful, rough change of this territory by geologists and builders caused the end of meetings with such creatures. The external description of the wild man, Tungu, shows that it has a perfect adaptation to Northern and Polar nature. It is a new specialized species that somewhat is similar to the human and at the same time differs from him. But from where and when had the unknown wild man come to these severe Northern territories? How it had occurred? Now we move 5000 km from wide Ob river to Yakutia in Eastern Siberia. We made there a similar investigations and had heard more stories about wild men of woods that are called there Chuchuna. In Yakutia they have the sharply outlined area of inhabitance. It includes mountains located to the East from Lena river and between Yana and Indigirka, mainly Verkhoyansk and Poloust mountains. "After the Revolution, in 1920, our villagers had met Chuchuna while picking berries. It was picking berries too and pushed them into its mouth with both hands. When it got sight of the people it had risen. It was very high and lean, probably, higher than two meters. He wore a deer skin and had bare feet. It had very long arms, its head was covered by mop of hair. Its face was as large as human's, but more dark. The forehead was small and protruded out above eyes like the peak of a cap. The chin was large, wide, it was much wider, than that of a human. It was similar to a man but far higher. In a second it started to run. It ran very fast highly jumping up after each third step." In Central and Western Yakutia people usually know nothing about Chuchuna. Those who know point the places in far Verkhoyansk region. When we had arrived to settlement Khayisadakh in Saydy-Verkhoyansk district area and had achieved the mountain pastures, the stories about Chuchuna poured on us like rain. The more we heard them, the clearer the image of Chuchuna appeared to us. Chuchuna was transforming from the supernatural into something almost real. It had no specific features that characterize the fantastic heroes. His appearance changes are of the same kind as human's. One time people saw mighty, strong, over two meters high, terrible and dangerous to the man. On the other case they came upon very high and lean creature. "It was, probably, sick ", the eyewitnesses told. It is interesting that Chuchuna are met usually in a certain season of the year. A century ago they were met especially frequently. In 1920 — 30-th the meeting with it occurred much rarely, and in 1950-th we registered two encountings of Chuchuna near Adycha river. How to explain, why most stories about Chuchuna came from this area? The grandfathers of present deer breeders observed even children of Chuchuna, swimming across the river in spring ice melting to steal some food. In all stories we could find surprisingly detailed, almost anatomic, description of its appearance — the appearance of a hominoid, that is extraordinary capable, strong, and adapted to severe conditions to live in the North. Let's look through "Urankhay Sakhalar" written by known Soviet historian and ethnographer G.Ksenofontov. There he writes: "Chuchuna — a kind of human. It hunts wild reindeers for food and eats the raw meat. They say that it tears off a whole skin from a wild deer and pulls this skin on itself. Presumably, it lives in holes or lairs like a bear. His voice is very hoarse and grating. It whistles and frightens the people and deer. The people came across it rather seldom and usually see it already running away. His face is so black that it is difficult to distinguish either nose, or eyes. It is seen usually in summertime and never in winter,"
Neither in the stories we heard, nor in the description of the known scientist Chuchuna has fantastic features. It looks like the creature of bones and flash. It is necessary to add, that besides the stories about Chuchuna in Verkhoyansk area there are tales about rare findings of human-like skeletons of extraordinary large size. Mostly that occurred in vicinity Adycha river. 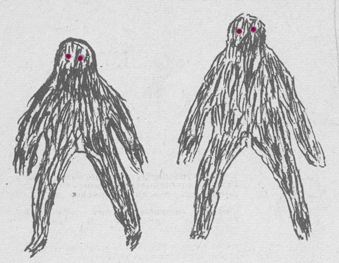 We can conclude from above that in four completely different huge areas separated by thousands of kilometers and natural barriers such as large rivers and mountains, there were recent stories about a wild wood creature similar to the human. It is the fact also that these stories exist among peoples of different ethnic groups, languages, and cultures. The identical features of habits and ways of life are also seen in the stories from all four regions. In Komi Republic — Ust-tsilma area, upper parts of rivers Pizhma and Tsilma. In Western Siberia — remote territory between Polar Ural. Nadyn and Taz areas of Yamalo-Nenets national district. In Yakutia — the Verkhoyansk mountains and places to the East. In the neighboring areas there are live people of the same nationality, occupation and level of education, but they do not know similar stories. And, if they heard, they address them all to the same areas mentioned above. The summer encountings in Yakutia point at migrations in the warm season. In Pechora area and especially in East Ural observations of wood giants take place all year round, except for two the most cold winter months. There is some periods of hominoid reveals in the areas. The inhabitants of settlements located there met it in 1951 - 1953, 1959 - 1962 and, at last, in 1967 - 1968. This periods are clearly shown while compare the 50 stories Victoria Pupko and me had collected in this area. It seems too early to make any sound conclusions, but in summary I wish to mark that our boundless grim North holds as many riddles and secrets, as snowy slopes of the Himalayas.